September 10th is World Suicide Prevention Day and September is National Suicide Prevention Awareness Month. To bring awareness to suicide prevention and to raise funds for suicide prevention efforts at Foundation 2, Insidious Ink Tattoos is offering special semicolon tattoos on both Sunday, September 9th and Monday, September 10th from 9 AM to 8 PM. 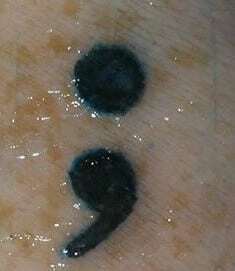 The semicolon tattoo represents mental health struggles and the importance of suicide prevention. The shop minimum is $50 for each tattoo, and Insidious Ink staff is only collecting $5 per tattoo for supplies. This means that at least $45 from each tattoo will be donated directly to Foundation 2 to prevent suicide in our community. Last year this event raised $2,225 for suicide prevention work at our agency. If you would like to schedule your tattoo please call Insidious Ink Tattoos at (319) 892-3369. In FY18, Foundation 2 received 5,465 suicide related calls and chats. Foundation 2 staff and volunteers will be sharing information about our services during this event. We hope that you will join us in Hiawatha on September 9th and 10th. Together we can help to prevent suicide.